There is a “figure of speech” for writing and articulating sentences, but to speak those sentences you have to figure out the “speech” by your own. Yes, it’s a paradox- all anchors accept. Let’s, dig it out more! 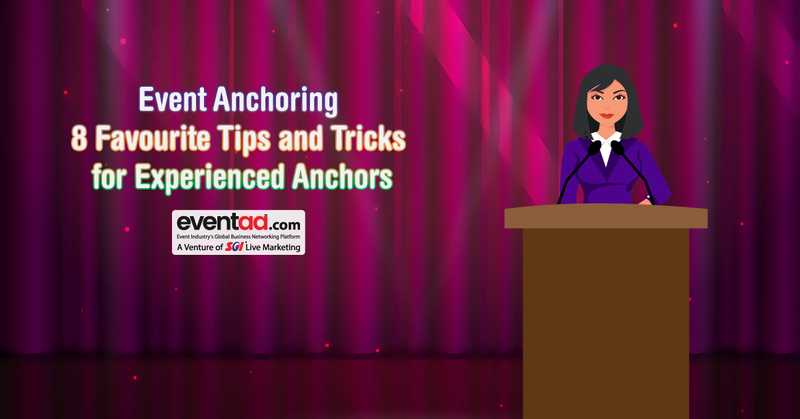 Anchors are like a magnet that pulls audience towards them in whichever direction they swirl. Here direction is your speech, body language, sense of humor, vocal cord, etc. If you are able to balance your synergy in all these territories while anchoring, then you have the shot. If you reckon above statements then it is inclusive that you are looking to become someone who lives by Anchorship day and night. To be a great anchor you do not require a glossary of fancier words but actually, needs to understand what kind of language gels best with the particular audience. You have to determine how you want your audience to feel when they leave the seminar or presentation. Take an example of a book that you finished in one go, and think why it made you do so. The reason is simple from start to finish there is always some interesting aspect that holds your interest throughout, same goes for anchoring. You have to spice up your performance with all the traits. There are many anchors whose career sky rockets even though they have just stepped into anchoring field, while there are few who have a lot of experience but never had advantage view of their success. It might happen that their anchoring for a longer time made them stick to an orthodox style. There are still few things that experienced anchors might not know, which can escalate their speaking or anchoring skills. Each individual has different tones and vocal acoustic but not all are eloquent speakers. There are few speakers who can electrify the audience and runs a stream of ecstasy in their bodies. So what sets them apart from the rest? If you like to mirror image them, then you would probably ingrain this article thoroughly. Audience love influencers. Even if you are not one of them at least try to get closer to it. According to Pam Sherman, author of “Speaking like a Successful Thought Leader”, revealed the secret of being a thought leader. She emphasized on three traits of Successful Thought Leader ----displaying your values, having a thorough understanding of your expertise, and presenting a topic in an emotionally engaging way. Always make sure you are giving enough room to the audience to absorb the information. Gabble for long or giving lengthy talk does not mean you have delivered a great speech.Your rate of speaking and articulation in tone matters while addressing the bigger audience. Most anchors prefer a rate of 150-160 words per minute. When you want to grab the attention of your audience, slow down a bit but if you want to wrap up the show then speed-up. Avoid fillers like “hmm” and “aah” in middle of the speech, it breaks the rhythm. But you can strategically take pause before and after the words and phrases you want to emphasize. You can also take a course of the teleprompter and ear prompter to further hone the skills. It might also be helpful in avoiding distraction due to some random thought pin during hosting. Do not forget to be a gullible and a creative host. Amuse your guest by cracking jokes and placing some good sense of humour. You have to look who is your audience--- A corporate, political summit, festival celebration, etc. you have to articulate your sense of humour accordingly. Remember your audience is there to get something from you and not the other way round. If your speech iterates a selling pitch, then in 9 out 10 cases your audience will doze off. Even if you want to sell something it does not have to be direct. If you want to be one of them, then be with them. Attend events and conferences hosted by famous speakers. Try to analyze what makes them adorable and note down their key stroke they use during anchoring.It means everything from their hands' movement, sarcasm, pointing out famous personalities from the attendees, etc. Your voice should resonate with the audience. True but not necessary, there are countless examples of celebrities who despite their voice stereotypes have made big in Hollywood. Arnold Schwarzenegger is one of them. You can master your voice by continuous and repetitive training. You can also break a long sentence into shorter if your pitch is too heavy for an audience to understand. Most influential speakers give overview or try to connect with the audience with personal stories, customer stories, brand stories, and stories of other successful individuals or companies. This helpsthem to connect with the audience instantly, as they will try to relate themselves to the stories. You can engage audience asking something that is related to their personal life, like how many of you interested in where you’re neighbor goes for shopping. If you take a deep breath and if your belly expands then you are breathing from the diaphragm, which is the right thing to do. Similarly when you give a speech try to speak from inside, from the gut. It enables you to echo better voice – check this example- first speak “ahh” and then speak the word “sing”, you will notice the difference. To pronounce words correctly it is imperative your facial muscles remain flexible. Practice by using tongue twisters, jaw exercise, massaging cheeks, etc. You can also do breathing exercise like --inhale deep for 4 seconds-hold for 7 seconds-exhale 8 seconds-pause-repeat. Your speech should not sound like a robot. It is weird but try to speak in a harmonious rhythm like musical nodes but practicing regularly can make your speech pleasant to hear. You speak loudly in an isolated place, it helps improve your speech. For an experienced Orator, it is odd to record their speech and hear. But a regular speaker improves their speech only by recording it and rectifying recurring errors. They can also compare their recording with an affluent anchor or ask them to identify the area for improvement. You can experiment from the above tips and tricks before your next event and can always share your experience. However, if you think your voice is different and have other training preferences, you can still share your views to help your anchor brothers and sisters.